It struck me today while watching the weather forecast on BBC News that since I can now get the weather from so many sources including Apple Watch it seems rather strange that I still watch it on the telly, but moreover that I’m really not sure after watching these things for so many years whether a “low pressure front” is a good or bad thing. I’m not even sure if “low pressure front” is the right phrase, is it “front of low pressure”, I really don’t know. And having now had an Apple Watch Series 4 Cellular 44mm on my wrist since it’s release on 21st September (and all other versions of Apple Watch before that!) giving me a months worth of use, give or take a few days, I feel ready to release that information for better or worse into the world. You’re welcome. During this period I’ve been using Apple Watch S4 daily for running, walking, cycling, indoor rowing, strength and conditioning, some pool swimming, and general logging while on a British Triathlon Federation Level 1 coaching course over a weekend (just wanted to mention that) and plenty of general use including hiking around the Isle of Wight during an unseasonable spell of glorious weather with my wife, taking sneaky looks at it during boring meetings and trying new games apps to keep me entertained, and have been comparing and contrasting it to my Series 3 watch. There’s plenty to discuss. In this first post I’m looking at the watch in general with a focus towards sports & health and fitness, but in subsequent posts I’ll drill down much deeper into the sports aspects. That’s not the least but true for me, but Apple generally pull this trick off so well with any new hardware release - once you have the new one, the old one seems so inadequate. Having watched the Apple Event yesterday for example, I just can’t understand how I have got by with my old iPad Pro 10.5 for so long - just look at those bezels, and wow what an idiot I must have looked when charging my pencil in Starbucks - too embarrassing. Of course they achieve this in some way through eliciting an emotional response that reacts quickly enough for you to hit the order button, and it takes a strong will to calm the chimp and take a more rational view. Hopefully this review is a bit more rational and based on reasonable amount of use and provides enough information so you can make a valid decision for your own purchasing choices. Of course this will still worth a read (I hope) if you are completely new to Apple Watch, and you can read this post in conjunction with the other posts on this site, using the search option or browse by category. For the more dedicated scenario of “I have a Garmin Forerunner should I switch to Apple Watch”, or “I have my first 70.3 and want to use Apple Watch to train for it” then this post is still going to be useful, but you will get more specific comparisons in the posts to come (and in previous posts on series 3) where I examine activity data and apps in more detail. Ok here’s what has changed hardware wise for series 4. Of course watchOS 5 has also brought many improvements available to all but the first gen Apple Watch, and there will be a separate post covering those. Series 4 has increased in size from 38mm and 42mm to the new 40mm and 44mm sizes. The 44mm is great for me with failing eyesight and is probably the most significant improvement for me because I notice it every time I look at the watch. And not only is the watch case larger but the screen now goes edge to edge and is in fact 30% bigger, meaning I can now put more metrics on a single screen for running and still be able to read them. Previously I would use the single metric option and use the digital crown to rotate through them, which was not as nice. To change which metrics are displayed on your watch when in an Activity go to the Apple Watch app on iPhone > Workout > Workout View. Then select either Multiple Metric and up to 5 items you want on a single screen for each type of workout (So you could select Duration, Heart Rate, Rolling Pace, Current Pace and Distance for Outdoor Run for example) or Single Metric in which case you will be able to scroll through all the metrics using the digital crown during the activity, with one displayed at a time. My wife though who has a series 3 38mm which she can read perfectly does not really want a bigger watch. To be fair she hasn't had it that long, so it’s too early to upgrade, and she hasn’t tried a 40mm one on as yet, but with her current usage I think the 38mm series 3 will be fine for her quite some time. Even with a bigger screen I have increased the Text Size in Settings > Brightness & Text Size > Text Size so everything is reasonably legible without having to take my reading glasses out. The Digital Crown in series 4 has changed in its manufacture and consequently its feel. The previous crown could occasionally become a bit stiff, and it was recommenced to give it a run under the tap every now and again to remove the crystallised sweat that had got in there (yuk!). Series 4 does not have this issue and it feels a lot smoother and consistent. Take a look at the video below to hear the differences. The side button has received a new design too and is now flush with the casing, which is just nice. Oh and the red dot for the LTE model (which I actually loved, especially when pair with my (PRODUCT) RED sport band) has now been refined to a more subtle red ring. Nothing to see here - all your old bands work on both watches, so do all the new ones. Phew! Series 4 has a new ceramic and sapphire sensor panel on the back which is designed to allow the signal on a Cellular watch pass through making the signal more reliable. This could also potentially improve battery life. Look out for testing on battery life in a future post. It also looks pretty cool. The Microphone has moved over to the right on the watch in series 4 and the speaker has got louder. Series 3 was a revelation in performance compared to series 2 and the previous sluggish series 1 and original watches. Series 4 increase this with a new processor (up to 2x faster) and Bluetooth 5 support. Performance is now a non-issue - everything happens as quickly as you want it to, and I haven’t had any issue with anything lagging or being slow. Bluetooth 5 is nice, but that hasn’t meant native support for things like Power Meters on bikes as yet, which is a huge frustration. There are ways around it with third party apps, or by taking your iPhone with you on a ride, but still disappointing support for more device profiles isn’t native in Apple Watch. In the US Apple will release support for taking a ECG reading using the watch and the Digital Crown, and hopefully this will come to the UK later (probably dependent on regulative requirements). I expect this to be much like the Kardia band that you can get now (see my review of this here). ECG (also called EKG) measures your heart pattern rather than just the beats per minute, and will be useful in detecting serious heart conditions which could be life threatening such as arrhythmia. Apple are touting battery life improvements over series 3 for workouts of an additional 1 hr. I will be testing this in a coming blog post. General battery usage though easily lasts a day on series 4, and I know people new to Apple Watch who are wearing it for 2 days including through the night (using a third party app to log sleep) and then just popping on the charger when needed for an hour. Series 3 requires a bit more charging in my experience and I typically just got in the routine of charging overnight, or for an hour in the morning while I showered and got ready for the day. Series 4 has an updated accelerator and gyroscope which should offer improvements in things like workout detection (for example swimming strokes in a pool swim), but also introduces a new health feature called “Fall Detection”. This is most definitely series 4 only even though it is enabled in software and watchOS 5. It is off by default, I assume because Apple don’t want to trigger false positives, but I have turned it on and not had any issue. 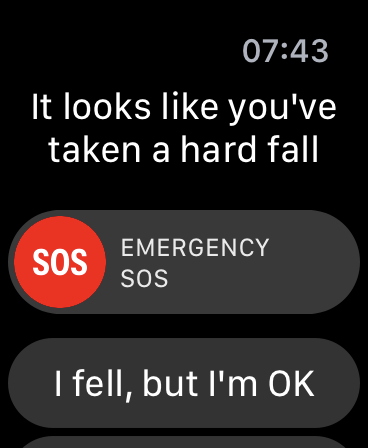 To turn it on, open the Apple Watch app on iPhone and select Emergency SOS and turn on Fall Detection. Undo the strap so the watch rests on your wrist. Twist your wrist and let you watch tumble to the ground. If you are quick enough you will get the fall detection notification as shown below. This is a pretty nice feature - and one useful not just for perhaps the elderly, but also in the case of exercise. Falling off your bike for example. Hopefully not one you’d need to use but certainly a comfort to know that it may offer some help if you do. I know this says new in watchOS, but it means watchOS on series 4 only! Much has already been written about the InfoGraph face. It is used in Apple Marketing, and is the first that supports so many complications (8 in total), together with cool new curvy corners ones . It definitely can be a bit overload, with so much colour you can feel overwhelmed and a little flashy when it pops onto your wrist during conversation, but of course you can customise it to have as much or as little info as you want, and even have multiple versions set up. So really it’s just another option for you, and you can take it or not. Personally I would in a heartbeat - primarily for the increased screen size over series 3 which really makes a difference to me. Even though it’s not that obvious in the screenshots above, having 30% more screen in a watch that doesn’t feel any bigger on the wrist is great news. Fall Detection is also rather neat, as will ECG when it is available, though these features may not be useful for everyone. Promised better battery life of an extra hour for workouts (taking us to a stated 6hours, though I will be testing) is great news too - and could mean the difference on a long ride or medium course triathlon. And other hardware improvements give a general tangible feeling of a high quality device. For new Apple Watch users, this In many ways this is what Apple Watch should have been on its first release - it’s an accomplished device that now feels refined and does everything it sets out to do with aplomb. And its intent is a now well defined as a Health and Fitness device, with extra emphasis on Health in this version, but also smart enough in looks and software to be a great every day watch too. So I guess that’s a yes.